Loot the Body is a board game. Family fun and adventure are the focus of this game design. Plenty of action, easy setup, play, and put away make it a great pick for any group. 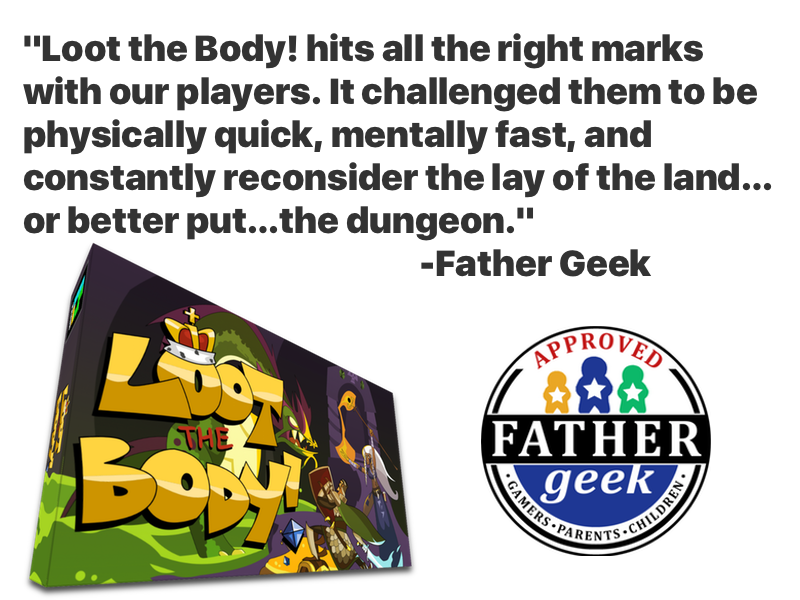 Loot the Body is an epic fast-paced dungeon crawl card game designed for gamers of all ages and skill levels. Sign up for our newsletter to get updates as we move toward publication. Loot the Body is a 2-6 player game for players 10 and up. Fast action, easy setup and teaching, deep layers of strategy, and a unique game experience every time you play all work to make Loot the Body a must have at the game table. New reviews and art reveals will be coming out over the next few months, so make certain you stick around. Loot the Body will also be entered into this years Cardboard Edison contest. We will post details on how it goes. If you would like to receive a review copy of Loot the Body please contact us.